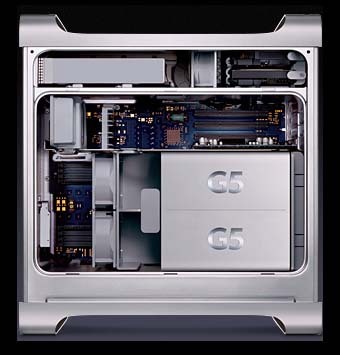 Your Power Mac G5 comes with 90 days of free telephone support and a one-year limited warranty. All models also include 30 days of free dial-up Internet service with EarthLink (North America only) activation. Internet access requires a compatible Internet service provider. 1-1GB = 1 billion bytes; actual formatted capacity less. 2- Wireless Internet access requires AirPort Extreme Card, wireless access point, and Internet access (fees may apply). Achieving data rates up to 54 Mbps requires that all users have an AirPort Extreme Card and connect to an AirPort Extreme Base Station. Some ISPs are not compatible with AirPort and AirPort Extreme. Range may vary with site conditions. 3-Second Apple flat-panel display requires Apple DVI to ADC Adapter, sold separately. 4- Check with manufacturer for compatibility. 5- Actual rates will vary. 6- Weight varies by configuration and manufacturing process.